Hanuman who went in search of Mata Sita in Lanka finds her and in the process also burns Lanka giving an indication to Demon King Ravana what is in store in future. Mata Sita returns the ring of Sri Ram that Hanuman had carried with him as a proof. Mata Sita also gives Hanuman her hair band as a proof that they met. When Hanuman was about to return from Lanka, all the gods appeared in the sky to bless Hanuman. Hanuman was happy and proud about what he had achieved. On reaching the mainland from Lanka, Hanuman felt thirsty and landed at an ashram. A Saint was meditating there. Hanuman kept the ring and the hair band near the Saint and went to drink water. Suddenly a monkey appeared and took the ring and put in the pitcher (Kamandalu) before the Saint. On returning Hanuman found the ring missing and asked the Saint what happened to it. The Saint narrated what had happened. Hanuman put his hands in the Kamandalu but to his surprise there were thousands of rings. Hanuman asked the Saint which one was Sri Ram’s ring. The Saint replied that all of them were of Sri Ram. Hanuman started counting them but lost count of them. There were innumerable rings. The Saint said that he is merely a witness, every Treta Yuga a Hanuman comes and keeps the ring down and goes in search of water. A monkey comes and puts it in the Kamandalu. Hanuman always returns without carrying the ring as Sri Ram is not bothered about it. 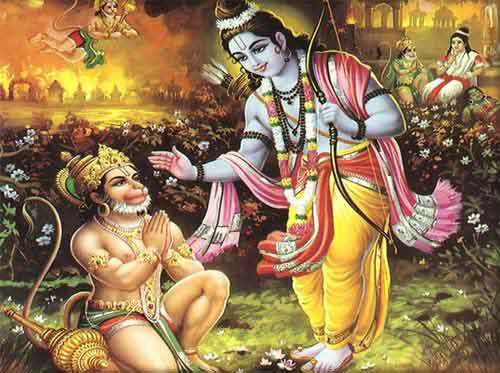 Later one day Hanuman narrates this wonderful incident to Sri Ram. Hanuman also finds the ring on Sri Ram’s hands. This wonderful story narrates about the thousands of yugas that had happened. As per Hindu teachings the cycle of creation continues forever. No one knows how many yugas have passed and how many will come in future.